Welling Family from the collections of the Worthington Historical Society (WHS) may be used for educational purposes as long as it is not altered in any way and proper credit is given: "Courtesy of the Worthington Historical Society, Worthington, OH." Prior written permission of the WHS is required for any other use of Welling Family. Contact WHS at info@worthingtonhistory.org to request permission. Welling Family is a picture, with genre photograph and group portraits. Its dimensions are 6.5 in. x 8.5 in.. It was created on Sunday, December 25, 1898. The Welling family is pictured here in front of Dr. Dickerson Welling's residence at the Northeast corner of New England Avenue and High Street. Standing (left to right) are David Welling (with dog "Shep"), Park Welling, Gussie Welling, Ben Beazell and Frank Welling. 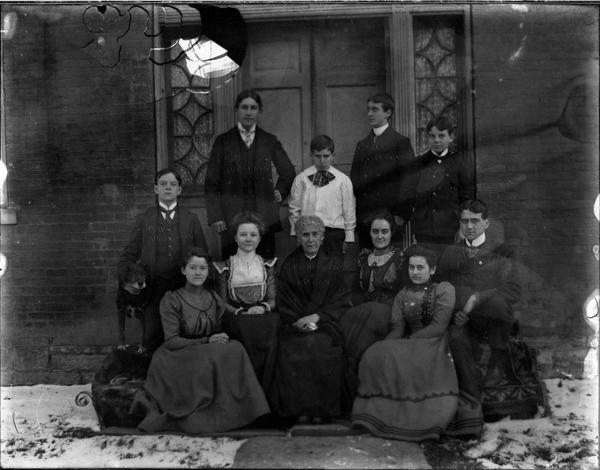 Seated (left to right) are Florence Welling, Mary Welling, Grandmother McCoy, Edna Beazell, Faith Welling and Preston Beazell. Dr. Dickerson Welling was a prominent physician in Worthington for many years, and took an active part in the community. He served in the Civil War, and then returned and attended the Ohio Central Normal School, Otterbein College, and the Eclectic Medical Institute in Cincinnati. Frank Welling, his son, was a repository of Worthington history, who died in 1977 at the age of 91. He was a self-taught artist who painted many local scenes. It features the people Dr. Dickerson H. Welling, 1847-1932, Frank Postle Welling, 1885-1977, Park Welling, ?-1903, Mary Caroline Welling (née Postle), ?-1944 and David A. Welling, 1884-1905. The Worthington Historical Society identification code is 93-G-241B. The Worthington Memory identification code is whs0615. This metadata record was human prepared by Worthington Libraries on April 22, 2002. It was last updated August 16, 2018.